Justice: Decided by Peers or Experts? Who should decide liability in a civil trial? Is justice best served if decisions are made by a jury of peers, or by a jury of experts, or by a judge? The answers to these questions have been debated since the beginnings of the trial by jury system and the debate is renewed after every controversial decision. This webpage explores the general strategies of different trial formats and how specific formats may favor either the plaintiffs or defendants in the Woburn trial. The parties can choose to have a trial by jury or a bench trial when cases go before the court. A trial by jury utilizes a panel of average or typical local citizens who are qualified by the parties to judge the arguments presented by the parties and determine a verdict regarding liability, whereas a bench trial is heard solely by a judge without empaneling a jury. Refer to the rules for civil procedures (Civil Procedure Rule 38) for information on requesting a trial by jury. In a bench trial arguments are presented directly to the judge for the judge's decision regarding liability and an appropriate penalty, if applicable. Generally, personal injury lawsuits tend to have favorable results for the plaintiff when the trial is brought before a jury. In this format the attorneys can dramatize the facts of the case and appeal to the emotions of the jurors. Where actual fault exists, this approach is often most financially favorable to the victims (plaintiffs) as well as to their legal counsel. However, this trial format is often not used in cases such as product liability, copyright infringement, or complex tax liability issues were extensive technical arguments are used to present the basis of fact. Since this trial format typically utilizes extensive expert witness testimony, parties typically will prefer a bench trial where they can focus their arguments to the court and hopefully convince a judge of their positions. Considering these formats and strategies, it is evident in the Woburn case that the plaintiffs favored a trial by jury, whereas the defendants likely would have preferred a bench trial. If a trial by jury occurs, as in the Woburn Toxic Trial, witnesses and expert witnesses who were able to communicate effectively to lay jury are critical to the trial strategy. The effectiveness of the experts' testimony in the Woburn trial can be evaluated by reading excerpts from their testimony. In the book and the movie "A Civil Action", it is clear that Jan Schlichtmann intended to try the case before a jury in hopes of invoking sympathy for the families of the victims. Schlichtmann felt confident that if he could get parents of the victims on the witness stand he would be able to sway the jury to side with the plaintiffs and that the financial benefit would be substantial. In the book and the movie, Jerome Facher, the lead attorney for Beatrice, indicated it would be important to the defense to prohibit the victims' family members from testifying. The defense knew the emotional stories related to the victims would be powerful, so it was in their best interest to push for a bench trial that would ride more on the technical arguments of being able to prove a connection between the contamination and leukemia. What resulted was a trial by jury but the trial being divided in three phases by Judge Skinner. Only the first phase of the trial took place. In this phase exceedingly technical arguments were presented concerning the sources of contaminant movement and the arriving times of the contaminants at wells G and H. The subdivision of the trial required that the first phase be almost purely scientific so the jury could decide if either or both defendants was liable for the pollution found in wells G and H. The second phase of the trial, which never took place, would have included the emotional testimony of the plaintiffs' families. 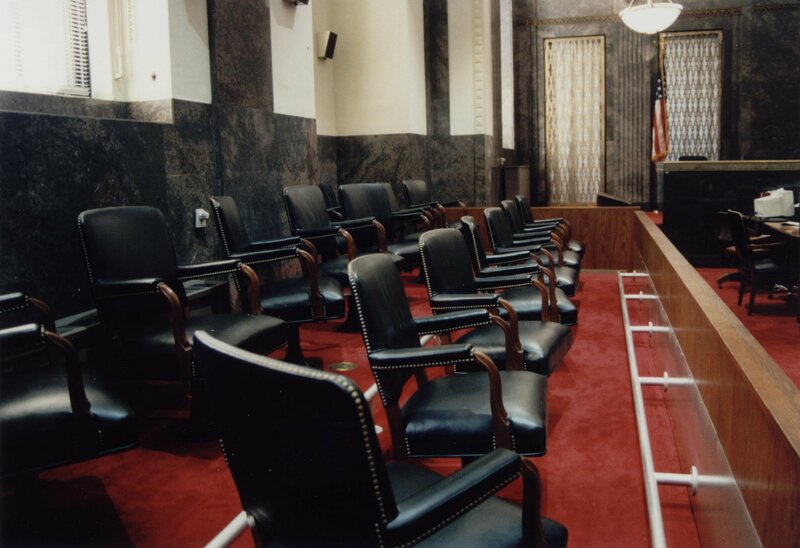 A goal of performing a mock trial is not to replicate exactly what occurred in the book or the movie "A Civil Action", but rather to have students become familiar with analyzing and evaluating data, presenting scientific arguments, defending their arguments, and becoming familiar with the legal process in a civil trial. A savvy defense team in a mock trial will spend their pretrial efforts trying to convince the judge that a bench trial format would best serve justice. Since their efforts would focus primarily on expert testimony and confusing the "concrete" opinions presented by the plaintiffs. Focusing arguments toward one individual (the judge) during a bench trial would eliminate the potential for the problems associated with educating a group of lay persons and having them grasp the importance of each and every technical argument. The plaintiffs may want to evaluate strategies where they would be able to try the case in front of the jury and use the stories presented by the victims' families as early as possible in the mock trial. This strategy could potentially offset some of the difficulties faced by Jan Schlichtmann when Judge Skinner divided the trial into three separate phases. An even more important aspect of the mock trial would include presenting the scientific data in a manner that can be easily understood by a lay jury and presented in a way to reduce the doubt which would be key to the defenses cross-examination strategy.